Pollinator populations are in trouble for a lot of reasons. Loss and degradation of habitat, pesticides, and diseases are all major contributors. However, at least in the Central United States, much of the pollinator decline can be tied to spiny pink/purple-flowered plants and the way humans react to them. 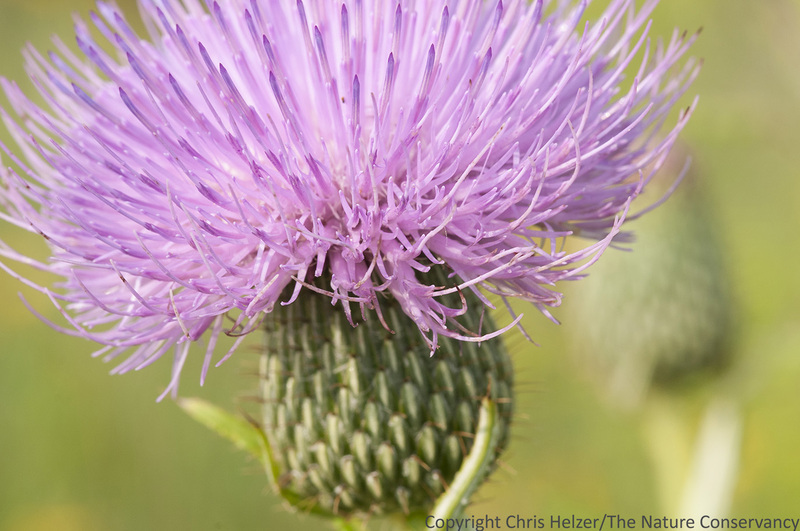 Tall thistle, a native annual wildflower, is a big favorite among pollinator insects. However, it is seen by many people as a weed that needs to be eliminated from the earth. On the face of it, thistles seem like they’d be pretty well-liked. Thistle seeds are a major food source for birds and other wildlife, as well as for a variety of invertebrates. The abundant nectar and pollen found in thistle flowers make them one of the most popular plants among both pollinator and non-pollinator invertebrates. As if that wasn’t enough, most thistles have large and/or abundant blossoms, which you’d think would make them very attractive to people. Sure, they’ve got spines, but so do cacti, yucca, and many other plants gardeners love to landscape with. So why do we hate thistles so much? The cultural dislike of thistles is not at all a new phenomenon; references to the unpopularity of thistles can be found at least as far back as the Book of Genesis in the Bible. There, thistles are mentioned when God curses Adam after he eats the forbidden fruit. Genesis 3:17-18 – “Cursed is the ground because of you… Both thorns and thistles it shall grow for you…” Clearly, if God includes thistles as part of His curse on all humanity, they are not a crowd favorite. Regardless of why thistles are so widely disliked, our contempt for them causes serious problems for pollinators. This happens in two ways: 1) direct destruction of an important floral resource for pollinators, and 2) major side effects associated with #1. Because thistles are so important to pollinators, our compulsion to destroy them is a major problem. Sure, some thistle species are invasive and can cause enough ecological damage that their control is warranted. Most thistle species, however, are targeted for destruction purely because they are thistles. Many of those are native wildflower species and are not at all aggressive or problematic. Regardless, there are few places where thistles are tolerated, let alone encouraged. The result is the loss of a big source of food for many pollinators. 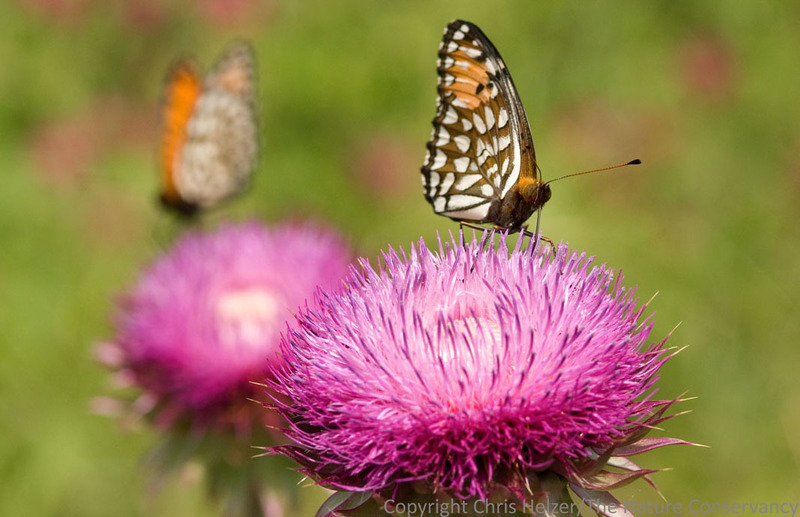 Musk thistles and regal fritillaries. Musk thistles are designated as noxious weeds and we are legally obligated to eradicate them.) The Nature Conservancy’s Platte River Prairies, Nebraska. While the loss of thistles themselves is a big problem for pollinators, the methods we use to eliminate them can have much bigger impacts. If we were content to dig thistles out of the ground one by one, things wouldn’t be so bad. Of course, that’s not always feasible – some perennial species such as Canada thistle are rhizomatous and can’t be killed by digging. Herbicide use is the other available option. Spot spraying individual plants or clumps can be relatively innocuous, but only if the person spraying is judicious and selective about what they spray. However, working thistles one by one takes a lot of time, and just because we hate thistles doesn’t mean we want to spend a lot of time getting rid of them. Broadcast herbicide spraying, by airplane or boom sprayer, can kill lots of thistles in very short order. It’s a great way to get rid of all those unsightly pink flowers in one fell swoop…at least for that season. Unfortunately, broadcast spraying also kills a wide array of other wildflowers, and most of those never recover (the ones that do are the ones we tend to like least – like ragweeds). The grand irony is that because broadcast spraying kills so many non-target plant species, the spaces left open by those dead wildflowers are usually colonized by thistles. Thus, while broadcast spraying is quick, it tends to perpetuate thistle populations by destroying their competitors. (Also, most large thistle populations are there because of chronic overgrazing or some other major disturbance that weakens perennial vegetation and creates space for thistles to grow. Broadcast spraying doesn’t address those underlying issues.) Oh, and by the way, killing off all the wildflowers in a pasture or roadside also wipes out the pollinators that depend upon them for food. Our cultural dislike of thistles leads us to kill off as many as we can each year. 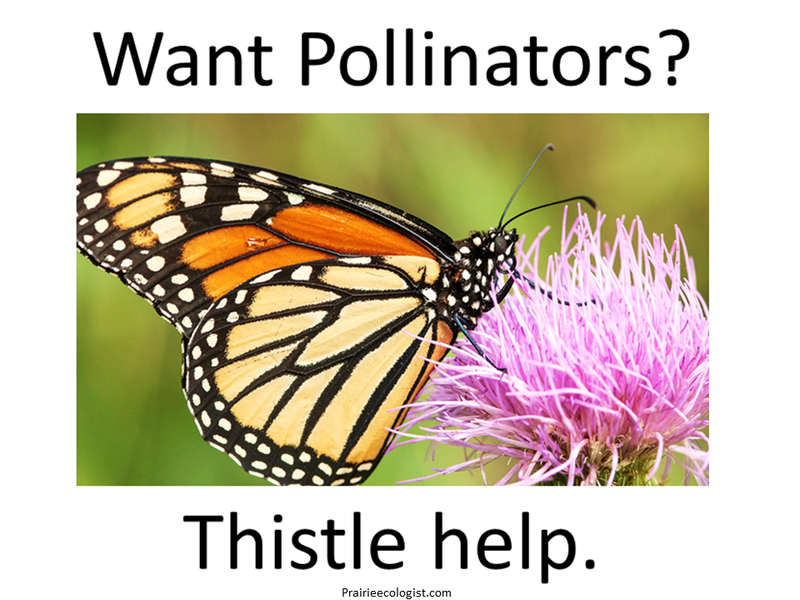 Since thistles are a major food source for pollinators, that’s grave news for pollinator conservation. Our desire for more “efficient” ways to kill thistles has led to even worse news, however – the loss of plant diversity across millions of acres. Since plant diversity sustains pollinators by providing varied and consistent food through the season, losing that diversity at a large scale is devastating. We can rebuild some of what we’ve lost through restoration, and we can save what’s left, but only if we change the way we think about thistles. We’d better hurry; pollinator declines are not slowing down. I think we need a thistle fan club. Who’s with me?? Let’s do this thing. I’ve come up with a basic logo and tag line (below) to get us started. Click here to get an easily printable version you can hang on your office door or tape to your car window. It’ll be a great conversation starter! In fact, let’s have fun with this. If you feel like it, take a picture of how you displayed the logo and put it on your favorite social media with the hashtag #thistlehelp. Not a social media person? Feel free to email me a photo – maybe I’ll collect some of them and use them in a future post. If you email me, please keep the file size below 1 mb… Use this email address: chelzer(at)tnc.org. The bees and butterflies of the world are depending on you. This is going to sweep the nation, you’ll see!